Police In Many U.S. Cities Fail To Track Murdered, Missing Indigenous Women Seattle-based researchers examined the disappearances and murders of Native American women in 71 U.S. cities. They found information on 506 documented cases — and huge, troubling gaps in the data. 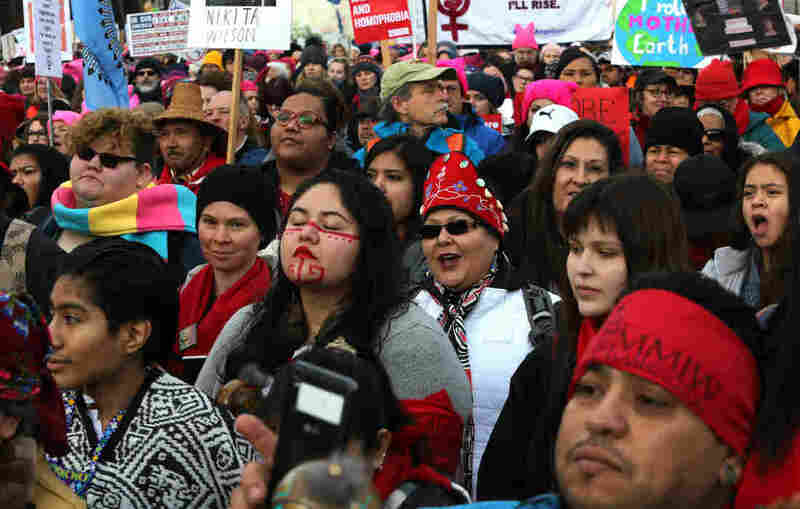 People listen to speakers raising awareness about missing and murdered Indigenous women at a rally at Cal Anderson Park in Seattle prior to the Women's March on January 20. A new report examines missing and murdered Indigenous women in cities, not on reservations, and found local law enforcement agencies often do not adequately track such crimes. A preliminary study by Canadian police found that indigenous women — 4 percent of Canada's female population — made up nearly 25 percent of its female homicide victims in 2012.